The International Monetary Fund produces Global Financial Stability Reports. The stand out report for me was the April 2008 report that highlighted Eastern European banks vulnerability to wholesale funding. I shorted many of the banks named in the report. Most fell 70% to 90% subsequently. Back then, Horseman was one of the handful of funds targeting fallen angels. Fast forward to today when discussing and shorting BBB credits, i.e. 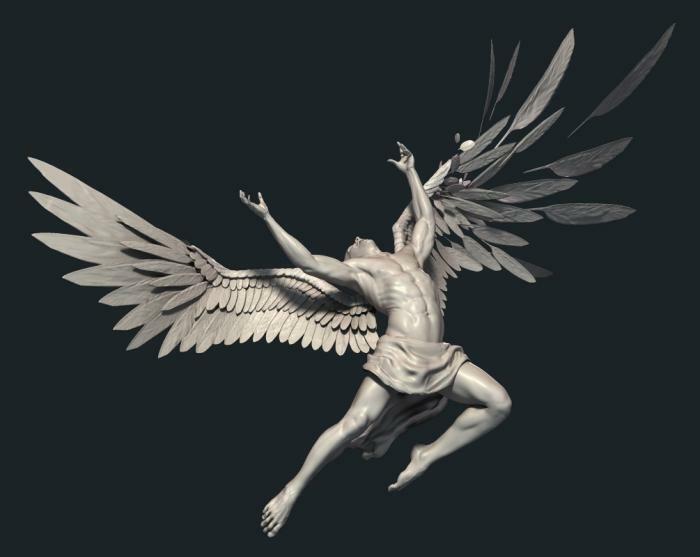 tomorrow's fallen angels, especially in the aftermath of the recent collapse of GE and PG&E bonds, is all the rage. And while it usually takes the peanut gallery about a year to catch up to the thought leaders by which point the idea is no longer relevant as it has been fully priced in, this case is the one case that may be the exception to the rule, as there is indeed good reason to be worried about the future, because as we discussed last month, the Next Bond Crisis will be the result of "Over $1 Trillion In Bonds Risk Cut To Junk Once Cycle Turns." To be sure, there is more than enough dry powder to start said crisis: as the following Deutsche Bank chart shows, the BBB-rated debt cohort has seen a massive increase in the past decade, with low-IG rated companies generously issuing debt to fund trillions in stock buybacks, or to acquire other companies, and now BBB debt accounts for nearly 60% of the entire $6.4 trillion US investment grade space, with a similar portion for Europe. And while the market now fully agrees that the next credit crisis will be sparked by the thunderous falling of "angels" into junk hell, with distressed investing stalwarts Oaktree Capital recently joining the bandwagon of fallen angel hunters, saying that the fund "expects to see a flood of troubled credits topping $1 trillion as rising interest rates overwhelm low-quality loans and bonds", the one question left is how much of this BBB paper is likely to be downgraded? Or, as one might say, that is the 6.4 trillion dollar question (the size of the US investment grade corporate bond sector). down as it will starting in 2019 and likely careening into a recession in 2020 as is now the prevailing consensus. What is a more likely scenario? As Burns writes, there have been numerous spikes. 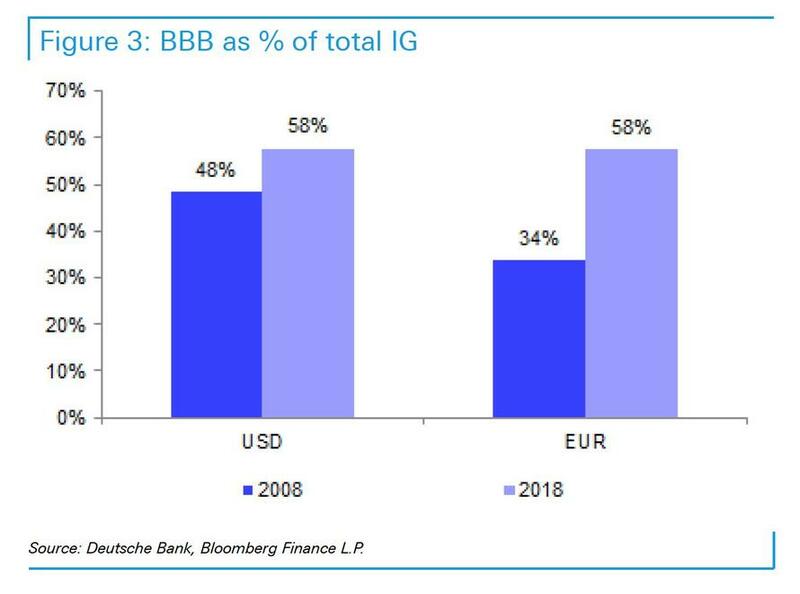 Specifically, the last time BBBs were as large a proportion of the IG market as they are today we saw the rate of decline into HY top out above 10%. 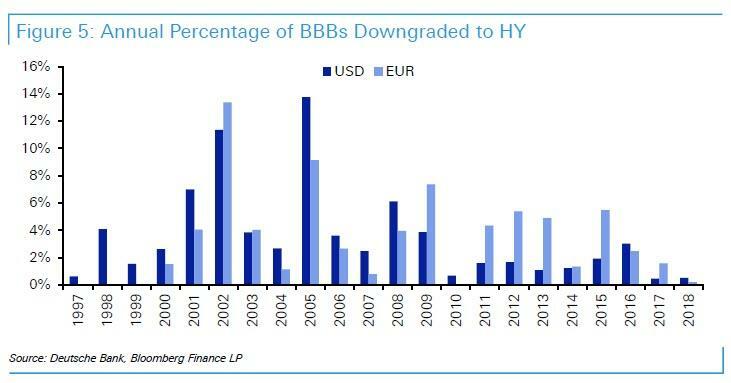 If we were to see something similar in the coming years then in face value terms this could see in excess of $260bn of USD BBBs and €80bn of EUR BBBs downgraded to HY. In context, that would increase the size of the junk bond market by about 25%. Here, Deutsche Bank, which has had its own share of balance sheet... concerns... notes that this forecast "is quite extreme and would only likely occur if we see a recession and even then this would be at the top end of historic ranges." Given we don't expect a slowdown until at least 2020, the near-term outlook could be far more sanguine although we don't expect a repeat of the ultra low levels of fallen angels of the last two years as we have now transitioned from peak QE to QT. A more normalized assumptions, one that excludes the past two years, suggests the average post GFC rate has been just below 2% in the USD market. Even a rate of this magnitude would lead to around $40-50bn of fallen angels in the USD market and €10-15bn in the EUR market. To give some context to these numbers HY net issuance in the last few years has been no higher than $75bn in the USD market (negative YTD) and €20bn in the EUR market. And while DB does not expect this dynamic to be too much of an issue in 2019, when the economy is still expected to grow, should there indeed be an economic slowdown/recession in 2020, then Deutsche warns that "the sheer volume of BBBs would become of much greater concern as we would expect rating trends to turn much more negative." Of course, what the German lender fails to note is that there will come a time some time in 2019 when the market will start pricing in this collapse in the credit market, leading to an avalanche of selling as asset managers try to get out "ahead of everyone else." It is that selling that will become a self-fulfilling prophecy and launch both the next recession, and the next credit crisis. As a final analysis, Deutsche Bank tries to assess how the downgrade outlook appears now from a micro standpoint. As Burns writes, without looking at this on a company by company basis "it's difficult to make any kind of assessment on whether there are currently worrying signs of deterioration even if there does appear to be more and more idiosyncratic stories." Even so, in the next two charts (Figure 6 and Figure 7), the strategist tries to provide some context for potential concern. Here we have looked at the bonds with an average rating of BBB- and highlighted how many notches of downgrade (across all rating agencies) it would take for those bonds to move from the IG to the HY index. In addition the German bank also highlighted whether these bonds are on either negative/positive watch/outlook and with how many of the three main rating agencies - an attempt to capture the proportion of the index already at threat of being downgraded even without a further escalation of macro concerns. Starting with the USD market, the first point to note is that around $160bn of the $736bn of BBB- bonds are on positive watch/outlook with at least one rating agency and therefore not at immediate risk of downgrade to HY. At the same time the opposite is true for around $150bn of bonds which are currently on negative watch/outlook with at least one rating agency. Perhaps of more interest are the grey shaded cells. These indicate where the number of notches of downgrade required is less than or equal to the number of rating agencies that have a negative watch/outlook. This total is currently $60bn, 8% of all BBB- bonds. So, DB warns, even without a downturn there is already a decent number of fallen angel candidates based on this analysis. The past two years have seen less than $15bn in each year. It's even worse in Europe, where of the €146bn bonds with a BBB- average rating €37bn are on positive watch/outlook with at least one rating agency. At the same time €21bn are on negative watch/outlook with at least one rating agency, €14bn of which are in the grey shaded cells. So around 10% of EUR BBB- bonds are already reasonably strong fallen angel candidates. For context, YTD we have seen just €2bn of fallen angels. As Burns ominously observes, even before we get to an economic slowdown - some time in 2020 - or even before the market start pricing the slowdown in, "it feels like the tide might be turning and we start to see fallen angels outpace rising stars over the next year." Deutsche Bank's conclusion: "Overall it’s pretty clear we are storing up significant potential problems for the next recession" with the question of how many fallen angels will be shifting to one of when the next recession will strike. And while next year may be spared, the German bank thinks that "the risk of the a recession in 2020 (whether it materialises or not) will re-focus minds on these types of issues as we approach and enter H2 2019." Judging by the recent blow out in IG spreads, the market has a far shorter, and less optimistic, timeframe. And while the timing is yet to be determined, keep a close eye on GE, PG&E and Ford bonds: the canary in the fallen angle/credit crisis mine will die when the first of these three "investment grade" names is downgraded to junk. To find a potential fallen angel, I looked through the holdings of investment grade bond ETFs to find large BBB bond issuers. The biggest of the BBB issuers happened to be the large telecommunication companies. The sector has over USD300bn of BBB rated debt compared to a high-yield market of USD 1tn. I am not a debt specialist, but I have noticed that falling share prices tend to be good lead indicators on debt downgrades.... US debt markets look in trouble to me, whether that has any effect on broader equity markets remains to be seen. In retrospect, after the biggest market rout since the financial crisis, it did.